Kanchanaburi has two railway stations. This one is located on the Sangchuto Road and it is the first one you come to on the trip from Thonburi train station in Bangkok. This is the station to alight from if you are staying at a hotel on the Maenamkhai Road area of Kanchanaburi where most of the river side hotels are located. You can carry on to the small stop by the famous Bridge over the River Kwai but this only makes sense if you are on a day trip to see the bridge. As train stations in Thailand go this one is fairly pretty. The building itself is wood and corrugated iron but a lot of effort has gone into putting flowers into pots and there is a great steam engine parked on display in the car park. 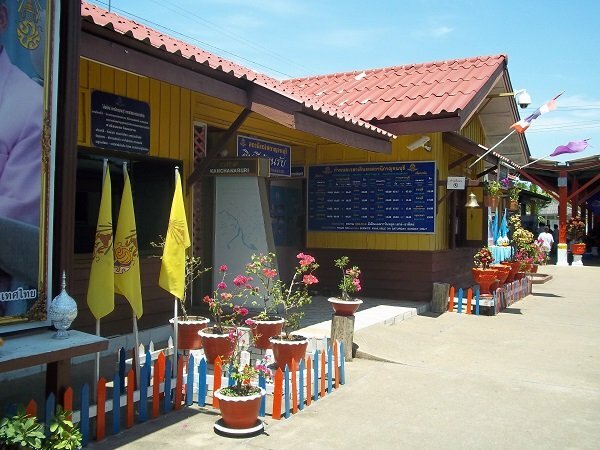 Kanchanburi main railway station is located on the town’s main road, the Sangchuto Road. It is 300 metre walk to the start of the Maenamkhai Road (where most of the resorts of located), about 2 km to the famous Bridge over the River Kwai and the JEARTH War Museum, and about 1,700 metres to the bus station located on the U-Thong Road. Unless you you really like walking, or your hotel is on the Southern end of the Maenamkhai Road, take a car. From the train station you have two options. 1. A tuk tuk or taxi. to the bridge or a hotel on the Maenamkhai Road expect to pay between 60 and 100 THB. 2. There are small orange and large yellow songthaews (converted pick-up truck with two rows of seats) in the back which ply the Sangchuto Road between the bridge and the bus station. They charge the locals 10 THB per person for the journey. Walking distance to many of the resorts and guest houses in Kanchanaburi. Only four trains a day pass through Kanchanaburi Train Statio, two in each direction: 2 trains to Nam Tok and 2 trains to Thonburi Train Station in Bangkok. You can only buy tickets for train travel on this line between Thonburi (Bangkok) and Nam Tok on the day of travel. It costs 100 THB a ticket no matter how far you go. There is a ticket office at Kanchanaburi Train Station where these tickets can be purchased. Toilets: There are toilets to the left hand side as you enter the station. Cargo Services: No freight facilities operate this train line. You cannot at present transport bicycles for other oversized items from Kanchanaburi train station by train. The Kanchanaburi Line runs from Nam Tok, in the far West of Thailand, to Thonburi Station in Bangkok. 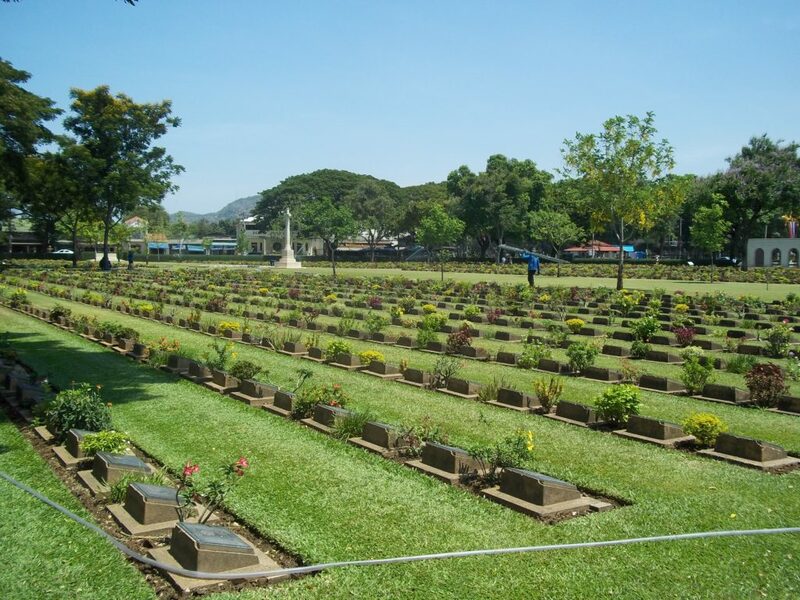 Chung Kai War Cemetery: Go out from the train station and across the car park to the main road. Cross over the road and the main entrance is about 30 metres to the left. Death Railway Museum: Go out from the train station, across the car park and then it is on a side road directly in front of you to the right hand side of the Chung Kai War Cemetery. Located by the river on a side street off the Maenamkwai Road is a 1.5 kilometre walk from the train station. There are closer hotels but not better ones. This resort is really nice. Its on the river, has a superb pool area, nice riverside restaurant and a very friendly atmosphere. The staff are genuinely nice people. The rooms are on the small side but very nicely decorated with good facilities like free WiFi and a range of foreign language channels. The hotel is also close by to lots of the best bars and restaurants in the area. This is a place you could happily stay for a few days.